This isn't a super pic, but I thought I would post them all together then as they are completed I can share them with you. I have joined another DYB rr. Truly international! I'll try to figure out how to get everyones blogs linked here. :-] Emiko and Hideko are from Japan. Jo is from New Zealand, Anna is from Portugal and Cheryl is in Wisconsin! 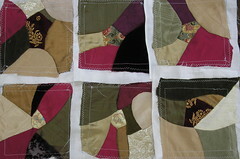 It will be great fun to see how these well traveled blocks turn out! While not about embellishment (for the moment) I just had to post about one of my furkids. What a face, isn't it?? 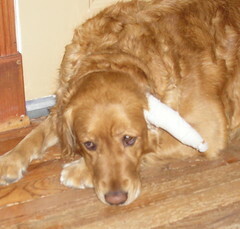 Poor girl developed an oral hematoma at the base of her ear and had to have surgery to drain it. She's been good about the bandage so far. I may have to make her a cq ear warmer tho cuz she's completely bare from the top of her ear down her throat! Can't have her getting a cold from this! Sooo.....many dollars later and a few trips to finally locate a vet who wouldn't scare her to death, we have her home and recovering! There has been talk about Noni juice on one of the lists and the miracles that it can work for allergies and such, so i'm going to try to locate some for her and see if her ear infections will clear up! More on that later! Goodness time flies!!! 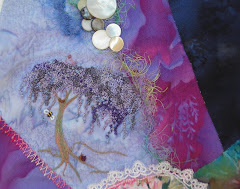 I've been busy with stuff and forget to keep up with my blog! Welllll....you're in for it now! 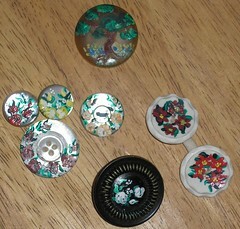 In one of the online cq groups I belong to, a class for painting buttons is taking place. This is a sampling of my beginning adventures! I think my favorite isthe black button, but some finishing touches still have to be done on these....like the top coat (minor detail) giggle! Plus I need to add more definition to the flowers for depth. But....for a first shot at doing something like this i'm pretty happy with the results. These are mostly roses, but I tried out some poinsettias and what I had hope would be some pansies but turned into more of a clematis! LOL!!! Then....of course....I had to do a tree! I will definitely have to do more of them in different styles! This is certainly a techinique worth trying!